The 4/8-channel system is designed for measuring and controlling the quality of electric power. maximum/minimum values of phase voltage, current, active, reactive and full power. ZET 017-E4/8 system is included into the State Register of Measuring Instruments. The system has a mode of operation as a standalone digital recorder with the possibility of subsequent reproduction and analysis of the recorded signals. Quality-to-price ratio of this system makes it truly unique if compared to similar devices currently available on the market. all necessary cables, adapters, and accessories. The standard in question outlines performance and quality regulations for power (PQ) in electric networks of general purpose power supply systems with three-phase and single-phase alternating current at 50 Hz frequency at the points of connection of electric networks owned by various power consumers, or receivers of electric energy (general connection points). PQ requirements established by this standard represent the levels of electromagnetic compatibility for conductive electromagnetic interference within general purpose power supply systems. Compliance with the mentioned regulations ensures electromagnetic compatibility of electric networks of general purpose power supply systems and electric networks of power consumers (receivers of electric energy). The norms established by this standard are applied for designing and operating the electric networks, as well as for establishing the levels of interference immunity of electric energy receivers and the levels of conductive EMI introduced by these receivers. 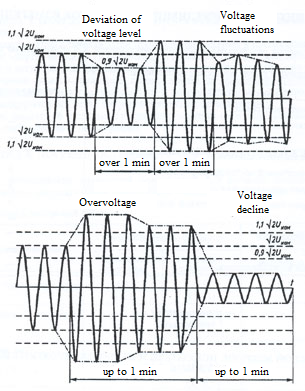 – temporary overvoltage duration is a time interval between the start and end of temporary overvoltage.